The samsung Galaxy S5 is now in stores and i have decided to make a brief but detailed report on it's exciting features and as well- The price in Nigeria. The samsung Galaxy S5 is really cool and has added more to the regular features we have come to know in smartphones globally. 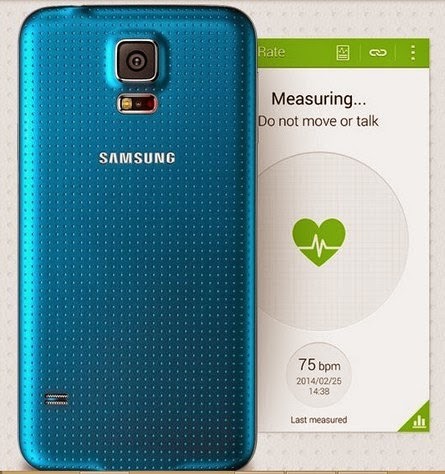 Firstly, it is the first smartphone that can help you stay healthy with a built-in heart rate sensor which enables you to measure your heart rate right from your samsung phone. Buy Samsung Galaxy S5 online and Pay on delivery. Click here to See current Price. You can get the samsung Galaxy S5 in Nigeria at the rate of 110,000 from online stores like Slot NG, Jumia and Konga or higher from retail phone shops but Guess what, one of the popular online stores and Etisalat is giving every one who orders the device from konga free 500MB data. Click here to get yours now. I hope this was helpful, kindly use the share buttons to share the info. with friends and connect with inforisticblog on Our Facebook Page, Twitter @Allentdon, Google plus or subscribe to inforisticblog.com with your Email address. nice review...hope to get one soon.